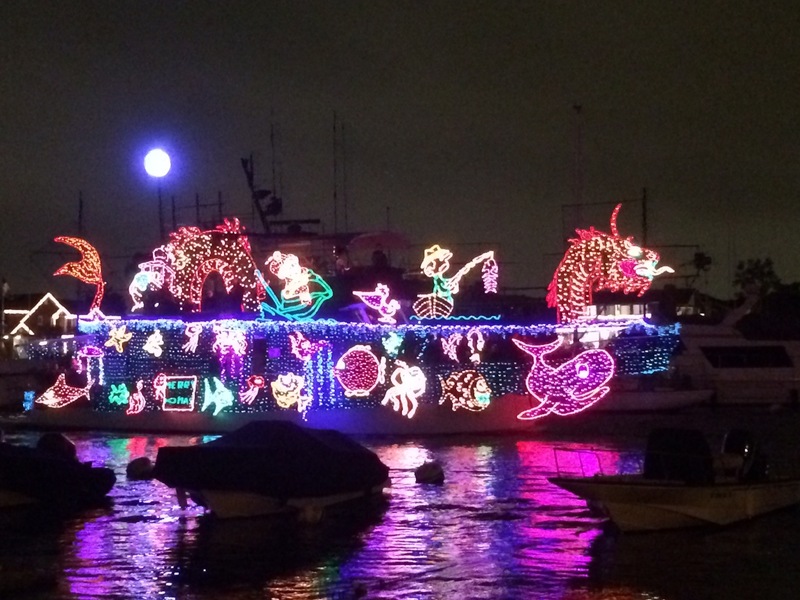 I just wanted to share a quick holiday post going into the weekend about what has quickly become my favorite California holiday tradition: boat parades. I witnessed my second this week on Balboa Island and it was even more fun than my inaugural boat parade in San Diego Harbor last year. Coming from the Midwest, I had no idea whatsoever about this bit of California Christmas culture. You see, the Midwest doesn’t have these, seeing as, among other reasons, the lakes and waterways have normally long frozen by now. The best it ever got there was holiday lights tour of high-end neighborhoods in a limo bus. That has its own charm, but it’s not the same, especially because it’s likely 10 degrees out. With a night in the balmy 60s on Wednesday, we stood on shore and watched a procession of fabulously decorated boats of all shapes and sizes. There were roughly 60 vessels or so, which I’m told pales in comparison to the previous years (and has been going for 105 of them now), but this is all new to me so I don’t have the buzzkill of history in this case. For 45 minutes or so, we watched a floating procession of Christmas trees, reindeer, Santa and lights, lights, lights! Like houses at Christmas, some boats were decorated modestly whiles others resembled the U.S.S. Griswold. And they came by blaring everything from Christmas music to rock. I appreciate the investment of time and resources it takes to put this on and will eagerly line up to grab some shoreline space to view it again next year. White Christmas? Wildly overrated. Water Christmas? Wonderfully West Coast. 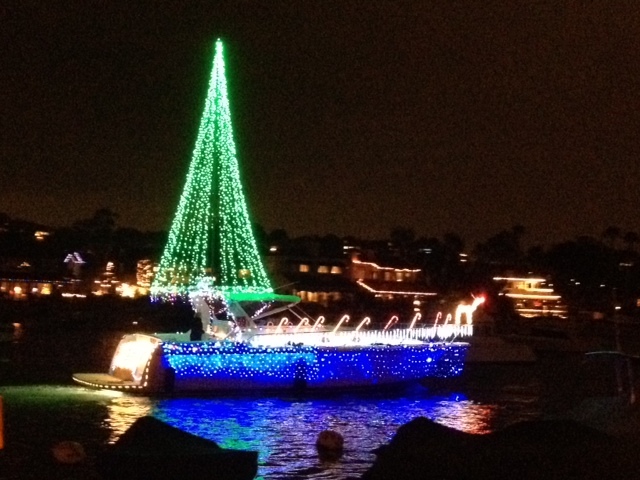 This entry was tagged Balboa Island, Boat parade, boat parades, christmas lights, Griswold, Newport Beach Christmas boat parade, reindeer, Santa. Bookmark the permalink.